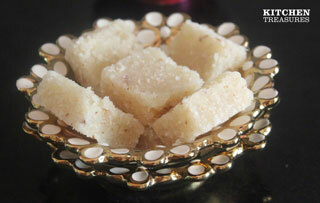 Here is the recipe of mouth melting Coconut Burfi that is made with very less ingredients. This simple delicious coconut fudge makes any festive occasion a special one. Add 100 ml of water to sugar in a broad pan and boil it. Let it boil till it reaches one string consistency. Meanwhile grease a plate and keep it ready. Add the grated coconut and cardamom powder 1/2 tea spoon and keep stirring. When the bubbles and foam start forming at the edges and everything comes together add 2 tables of ghee and keep stirring. Now throw in a pinch of cooking soda. When the foamy whitish bubbles form and the mixture thickens, transfer it to the greased plate. Wait for 5 minutes and then cut it into pieces when it is warm. Note: The coconut should be added to sugar syrup when it comes to one string consistency. Otherwise the burfi will become hard. While grating the coconut leave the part of coconut near the shell, since it will change the colour of the burfi to brown.